The overarching goals of the Sea Change project are to bring about a fundamental “SeaChange” in the way European citizens view their relationship with the sea, by empowering them – as ‘Ocean Literate’ citizens - to take direct and sustainable action towards healthy seas and ocean, healthy communities and ultimately - a healthy planet. • Compile an in-depth review of the links between Seas and Ocean and Human health based on latest research knowledge outputs. • Build upon the latest social research on citizen and stakeholder attitudes, perceptions and values to help design and implement successful mobilisation activities focused on education, community, governance actors and directly targeted at citizens. • Build upon significant work to date, adopting best practice and embedding Ocean Literacy across established strategic initiatives and networks in order to help maximise impact and ensure sustainability. • Ensure that efforts to sustain an Ocean Literate society in Europe continue beyond the life of Sea Change through codes of good practice, public campaigns and other ongoing community activities. • Ensure that all activities of Sea Change are carefully monitored and evaluated to ensure maximum sustainability, effectiveness and efficiency. • Ensure knowledge exchange with transatlantic partners to bring about a global approach to protecting the planet’s shared seas and oceans. EMB is leader of Work Package 1 “Sea Change Fundamentals - Baseline Review” and is involved in Work Package 5 "Mobilisation:Marine Governance". WP1 will provide the Sea Change fundamentals through the provision of background information on the concept and state of Ocean Literacy, as well as drawing together information on how Ocean Literacy is currently embedded in different sectors of society, such as formal education and current governance. WP1 will provide valuable information that can be used as standalone communications material throughout the project, as well as information to support the mobilisation work packages (education, engagement and governance). WP5 will engage in a dialogue with key actors of the international marine governance system with a particular focus on Europe and the trans-Atlantic context on the link between human health and the health of the seas and ocean in order to improve decision-making and subsequent policy development. An animation 'Sea Change: Increasing Ocean Literacy', explaining Ocean Literacy and introducing the Sea Change project, developed by EMB and CoExploration Ltd. From Sea Change Project on Vimeo. An animation 'Human Health and the Ocean: What's the Connection? ', highlighting 5 ways in which the ocean affects our health and wellbeing. These links include climate regulation, food, pollution, medicine and the blue gym effect. The aim of the video is to raise awareness of how the ocean affects our health and therefore the importance of keeping our relationship with the ocean healthy. From Sea Change Project on Vimeo. Further Sea Change project deliverables can be accessed via the Sea Change website. The Marine Strategy Framework Directive (MSFD) is designed to deliver “Good Environmental Status” (GES) in EU marine waters by 2020. This Directive requires that Member States (MS) with marine territories put in place measures to achieve and maintain GES within a defined timeframe and according to eleven key descriptors of environmental status. However, there is a significant knowledge deficit which may hinder full implementation of the MSFD and the achievement of GES in EU waters. The STAGES project is designed to directly address this knowledge deficit. The European Marine Board led Work Package 4: “Building a Science-Policy Interface to support MSFD implementation”. A Proposal was developed based on extensive Stakeholder consultation (survey and workshop) and reviews of Best Practice to develop recommendations for an effective long-term Science-Policy Platform for MSFD. The Proposal sets out key components and recommendations for a SPI, together with a roadmap for step-wise implementation. It identifies the need for the SPI to build on existing initiatives and to focus on developing four key areas, namely: Harnessing MSFD-relevant knowledge through a strategic approach to knowledge management; Scientific and technical advice to provide relevant and timely advice to policy makers; Expert evaluation and synthesis of scientific knowledge to assess research needs and gaps and inform foresight activities and research agendas; Knowledge brokerage which lacks recognition and requires specialized skills spanning science, policy and communication. 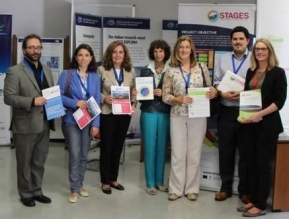 The proposal was presented at the STAGES final workshop on 19 June 2014 and the final version is now available here. 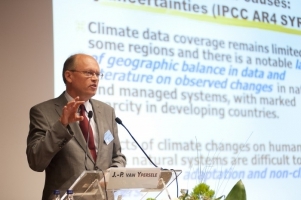 MSFD Project Coordination Group: On 23 September 2014, EMB presented STAGES and the final science-policy interface proposal to key MSFD stakeholders at a meeting of the Project Coordination Group at DG Environment in Brussels. Participants included representatives of National MSFD Competent Authorities, Regional Sea Conventions and the European Commission. This followed a presentation of the Concept Paper for the SPI to an earlier meeting of PCG on 10 March 2014. STAGES @ EurOCEAN2014: On 7-9 October, STAGES partners joined some 340 European scientists, policymakers and other experts gathered in Rome for the EurOCEAN 2014 science-policy conference. Coordinator Marisa Fernandez presented STAGES in a session on Good Environmental Status together with presentations by the European Commission DG Research and Innovation, DG Environment, the Joint Research Centre and the OSPAR Regional Sea Convention.In a Plenary session, Maria Betti (Director, Institute for Environment and Sustainability, EC-JRC) launched the MSFD Competence Centre which will act as a science-policy interface for supporting implementation of the Marine Strategy Framework Directive into the future. In the same opening session, Marianne Wenning, Director, Directorate C: Quality of Life, Water & Air, European Commission DG Environment, presented on ‘Marine ecosystems in Europe - policy objectives for healthy oceans’. The full EurOCEAN 2014 produced a Rome Declaration setting agendas for seas and oceans research. Photo: STAGES partners and representatives of the European Commission at EurOCEAN 2014 in Rome, 7-9 October 2014. From Left to Right: Telmo Carvalho (EurOcean), Anna Cheilari (EC, DG Environment), Ana-Teresa Caetano (EC, DG Research and Innovation, Marine Unit), Sigi Gruber (EC, DG Research and Innovation, Head of Marine Unit), David Murphy (AquaTT), Kate Larkin (European Marine Board). To achieve full community input to the science-policy interface proposal, WP4 led by EMB conducted an extensive stakeholder consultation in 2013 and 2014. This took the form of a consultation survey, in-depth interviews with key actors and a stakeholder workshop. The methodology, analysis and results are presented in STAGES Deliverable D4.1. Between 31 May and 17 July 2013 the European Marine Board launched an online Consultation on the MSFD science advisory process (Task 4.1). The survey was sent to European marine stakeholders working at a European, Regional and National levels. 112 full responses from 26 countries were received by the close of the survey with representatives from numerous marine sectors including; navigation and shipping, tourism and leisure, marine science/research, government, marine policy , fisheries and aquaculture, conservation, extraction, energy and marine spatial planning. On 12 February 2014, the EMB, in collaboration with the DEVOTES project, held a Stakeholder Workshop in Brussels to further collect views from MSFD stakeholders. Visit the workshop webpage here. Responses from the full Consultation have been used to assess Stakeholder engagement in the MSFD science advisory process and ways to enhance knowledge uptake. Results have informed the development of a proposal on recommendations for a long‐term science‐policy interface to enhance MSFD implementation (Task 4.2). An advanced draft of this paper was presented to external stakeholders at the final STAGES meeting on 19 June 2014 in Brussels. Stakeholders attending included the European Commission, Regional Sea Conventions, national MSFD stakeholders and industry. SEAS-ERA is as an overarching marine FP7 ERA-NET. Several European strategic fora (e.g. ESFRI) and European Commission’s Communications (e.g. Communication on Joint programming, 2008) have emphasised marine research as a field where major synergistic benefits can be reached by improving the coordination of research and infrastructure investments. SEAS-ERA overall objective is to facilitate the establishment of a stable and durable structure for strengthening marine research across the European Sea Basins. To do so the project brings together 20 major European Marine Research Funding Organisations from 20 countries in the basin regions of the Atlantic, the Mediterranean and the Black Sea, and the Marine Board. Enhance public awareness of marine and maritime scientific and policy issues in Europe. The launch of the SEAS-ERA project confirms the realisation of the impact of the MarinERA FP6 ERA-NET (whose deputy coordinator was the Marine Board), and awareness of the benefits and opportunities for increased cooperation between national funding programmes (see MarinERA legacy publication, April 2009 Download). To ensure that past achievements are integrated in future developments , the Marine Board is leading SEAS-ERA strategic analysis activities. Marine biotechnology has the potential to provide a major contribution towards addressing some of the most pressing societal challenges, including environmental degradation, human health and delivering sustainable supplies of food and energy. A sound strategy and a concerted coordination of relevant national and regional RTDI programmes in Europe are urgently needed to allow this potential to be realized. The main goal of the MarineBiotech project is to reduce current fragmentation and duplication, and pave the way for common programmes and cooperation through a future ERA-NET in marine biotechnology. Developing a common vision for marine biotechnology RTDI. The final conference of the MarineBiotech project, entitled Challenges and Opportunities for Marine Biotechnology in Europe, took place at Royal Flemish Academy of Belgium for Science and the Arts, Brussels, Belgium, on 11 and 12 March 2013. Discuss the status and progress in the support and coordination of marine biotechnology research in Europe to inform future policy and coordination efforts. Conference Sessions addressed among others: (i) Research collaboration challenges and opportunities, (ii) Science policy and coordination: progress and remaining issues, and (iii) Industry-academic collaborations: lessons learned for the future. The conference also presented the outcomes of the CSA MARINEBIOTECH project and looked forward towards the MarineBiotech ERA-NET. If awarded, the ERA-NET will start late 2013 or early 2014. This conference was co-organised by the European Marine Board and Flanders Marine Institute (VLIZ) for the CSA MARINEBIOTECH Project. Further to a successful collaboration during the influential EurOCEAN conferences and the Portuguese EU Presidency 2007 Lisbon Conference, the Marine Board joint forces with the maritime research community to participate in the FP7 EMAR²RES project.The EMAR²RES project involves, as consortium partners, the European Associations representing the major waterborne R&D stakeholders and the Marine Board, as key representative of the marine science research community. The project investigates cooperation between marine and maritime research communities with a focus on maritime transport. The partners investigate what kind of appropriate and efficient cooperation would meet help both communities meet the seas and oceans science and technology challenges sustainably and in the context of climate change. Possible structures for long lasting cooperation where operational feasibility and economical sense should be used along with environmental and social impacts to properly assess the overall impact of particular policy/political decisions. On 22 March 2012, EMAR²RES will hold a joint stakeholder conferences together with another partnership project, MARCOM+. MARCOM+ aimed to support the marine and maritime science communities to test mechanisms for the establishment of a European marine science partnership that would contribute to developing interactions between partners (Member States, regional authorities, the research community, industry and other stakeholders).The Marine Board participation in the MARCOM+ project was based on its experiences as a facilitator in establishing a sustainable dialogue between the marine and maritime research stakeholders, industry representatives and policymakers and advisers.On 22 March 2012 MARCOM+ held a final conference with another partnership project, EMAR²RES, entitled "Fish and Ships". As part of its responsibilities as work package leader in this project, the Marine Board Secretariat organized two MARCOM+ Open Fora. The events brought together various stakeholders, from policymakers to scientific community and industry, to debate a possible structure for a European marine - maritime science cooperation. Furthermore, the event provided the first opportunity to reflect on the outcome of the EurOCEAN 2010 and the Ostend Declaration, which called on the EU Member and Associated States and the EU institutions to recognize that "the seas and oceans are one of the Grand Challenges for the 21st Century". Consolidated stakeholders' advice is essential to address such a challenge. The 2nd MARCOM+ Forum discussed proposals on the structure and functions of a future European marine-maritime science collaboration, which would inform the science-policy developments, e.g. the Horizon 2020. CLAMER project aimed to raise the awareness of European citizens and society at large to the effects of climate change on the marine environment and their socio-economic consequences. The project built upon the concept that there is a gap between what is known through research and what policy makers and the public know and understand about the impacts of Climate Change on the Oceans; and that this gap needs to be filled to help catalyse formulation and acceptance of the necessary mitigation and adaptation measures for the marine environment. 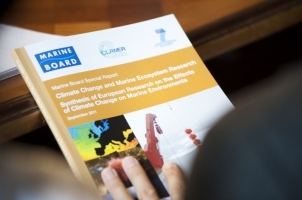 The development of the report was coordinated by the Marine Board Secretariat based on contributions from the members of the CLAMER Scientific Expert Panel (SEP) and additional invited experts. The SEP included some of the main researchers and coordinators involved in key European marine ecosystem research activities during the past decade and several former contributors (incl. the coordinating author) of the Marine Board Position Paper 9 Impacts of Climate Change on the European Marine and Coastal Environment (2007). The first European poll about public perception of climate change in the marine environment. Over 10,000 people from nine European countries participated in the poll by completing an online questionnaire. Simultaneously, an additional survey was made in Ireland (sponsored by the Marine Institute, the Environment Protection Agency and the Heritage Council of Ireland). The poll results were presented at the CLAMER Conference and published on the CLAMER website. MarinERA was a pilot EC European Research Area Network (ERA-NET) established to facilitate collaboration between national and regional marine research programmes in Europe. MarinERA contributed to raising a collective awareness of the benefits of, and opportunities for, increased cooperation between national funding programmes and programme managers. As a resulf of this awareness, an FP7-funded marine ERA-NET, SEAS-ERA, was launched in 2010. Marine Board leads some SEAS-ERA strategic activities, ensuring that past achievements are integrated in new developments. MarinERA Projects Database: on-line searchable marine research projects database has been launched by the MarinERA project. The database contains details of over 900 current marine research projects being funded by MarinERA partners. The database provides a unique source of material for marine scientists and policy-makers to access data on current marine research projects, identify potential research partners and nodes of specialist expertise. MarinERA on-line Map of Atlantic European Marine Research Centres facilitates closer cooperation in marine research between those Centres, and complements similar regional databases. AmpERA ERA-NET provided the forum for a EU perspective on accidental marine pollution research. Among its objectives was to enable research to be planned strategically to address the needs for the entire community, not just individual nations, and maximize the outputs from existing efforts. 1st transnational call: resulted in approval of six projects (total funding: €2.5M). This foresight project aimed to define the research required in the medium term (10 years) to enable sustainable exploitation and farming of aquatic resources. The project focused on projecting the future needs for strategic fisheries and aquaculture research. It provided scenarios based on current trends and the requirement of sustainable production, and addressed future policy and research needs.